Costco continues to fire on all cylinders, but the stock may be too hot to handle right now. In early 2017, Costco Wholesale (NASDAQ:COST) snapped out of a growth slowdown. Since then, the warehouse club giant has stayed red-hot, consistently posting strong sales growth. Costco stayed on track during its July fiscal month: a four-week period that ended on August 5. Total sales surged 10.1% year over year last month, continuing a streak of double-digit revenue growth. This shows that Costco's strategy to use unbeatable prices to bring in more shoppers is still working. That said, Costco stock has surged roughly 40% in the past 12 months, nearly tripling the market's return. The company's strong growth seems to be fully priced into the stock today. Costco Wholesale Corporation Stock Performance, data by YCharts. Last month, Costco's comp sales increased 8.3% year over year. As has been the case for most of the past year, rising gasoline prices boosted Costco's reported comp sales results thanks to the company's substantial gas station business. Excluding the impact of rising gas prices -- as well as currency fluctuations -- comp sales would have risen 6.4% in July. That's just slightly slower than Costco's average comp sales growth for the 2018 fiscal year, which ends in early September. Most of the comp sales increase was driven by higher customer traffic, with increased transaction sizes having a smaller impact. Costco had previously posted a 6.9% comp sales gain for June and an even more remarkable 8% increase for May. Total sales rose by double-digits in both of those months, as well. This puts Costco on track to deliver strong results for the fourth quarter of fiscal 2018. Last month, Costco's sales performance was very consistent across all of the major regions where it operates. Excluding fuel and currency fluctuations, comp sales rose 6.6% in the U.S., 5% in Canada, and 7.1% in the rest of the world. Within the U.S., the strongest results came from the Midwest, Southeast, and the San Diego area. The top-performing international markets were Spain, Japan, and Mexico. Costco posted solid comp sales growth in all regions last month. Image source: Costco Wholesale. There was also broad-based strength in terms of merchandise categories. Food sales rose slightly less than the hardlines and softlines categories. As has been the case for much of the past year, appliances, computers, and tablets were all standout performers, as Costco has capitalized on competitors' store closures. One notable aspect of Costco's July results was that its e-commerce sales growth slowed again. Adjusted for currency, e-commerce growth decelerated to 21.6% last month from 27.7% in June and 33.3% in May. To the extent that Costco's sales growth is slowing, this is a key reason. However, there's no real cause for alarm. Costco noted that its online business accelerated in mid-2017, so it is starting to face tougher year-over-year comparisons. In early June, I argued that investors shouldn't worry about the gross margin pressure Costco experienced last quarter because of its strong sales growth and long-term pricing power. Shareholders who stuck around have been rewarded. Costco stock has rallied more than 11% since then, nearly tripling the market's return. However, that has left the stock trading for about 29 times forward earnings. While Costco shares have traded at a premium valuation for years, this is at the very high end of the typical valuation range for the company. Furthermore, earnings growth is likely to slow somewhat in the coming years. In the past two years, Costco has benefited enormously from a new credit card deal, a membership fee increase, and the reduction in the corporate tax rate. However, the company usually waits about five years between membership fee increases, while the other two earnings growth catalysts were one-time events. For the next few years, Costco will likely match the high single-digit earnings growth rate that it averaged in 2014 and 2015, when it was generating 6% to 7% comp sales growth but didn't have any other major earnings catalysts. That would be a solid result, but hardly spectacular. 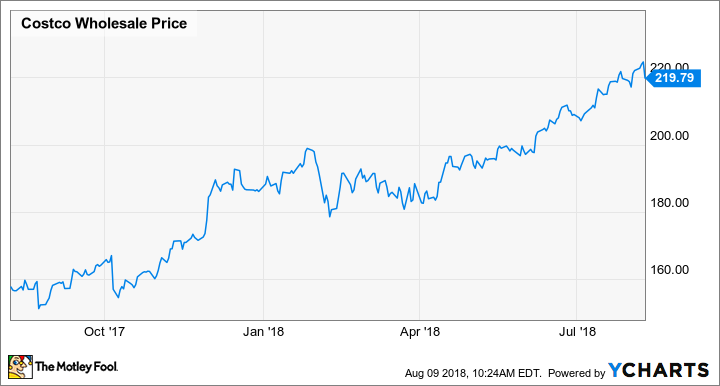 With Costco stock now trading at an even loftier premium than usual, this might be a good time for shareholders to take some money off the table.